Brad likes clothes. Most know this; I’m not ashamed. 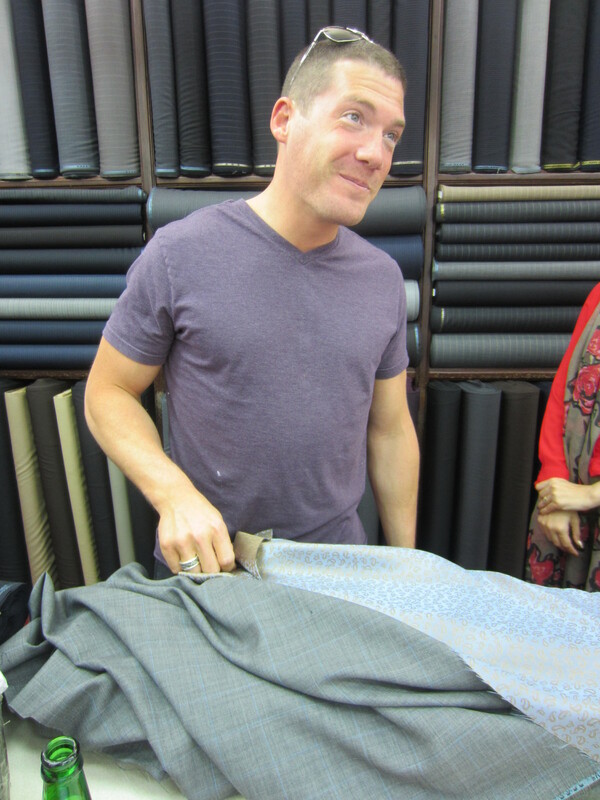 So I came to Thiland with a very specific souvenir in mind: some custom jackets from one of Bangkok’s nicest tailors. Now, a cursory stroll down the street would lead you to believe this to be as simple as, well…strolling down the street and picking one. But it’s not, and like everything else in Bangkok, extreme success and miserable failure are often adjacent and identical at first glance. There are hundreds of tailors. 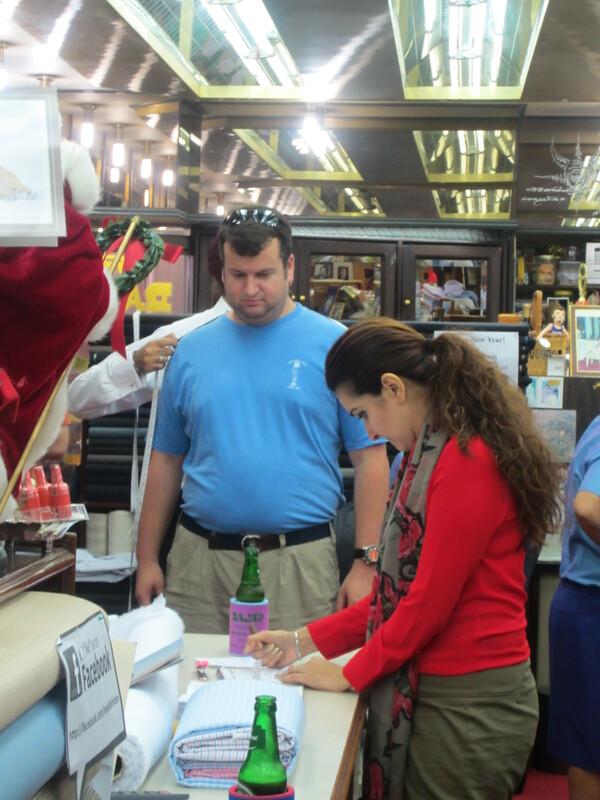 When they’re not busy, the proprietors stand on the street and coax you in for “bespoke” haberdashery. And most of it is pure balderdashery. So Hunter researched, we conferred, and on the first day of our visit to Bangkok we strolled down Sukumvit Road to meet Mr. Bobby Gulati. Nestled among the ex-pat beer patios, aggressive hustlers, and blinding neon lights of Nana Plaza sits his Raja’s Fashions, acclaimed and widely accepted as the best tailor in Bangkok. We arrived at his door weary from travel and intimidated…neither Hunter nor I have done the custom suit thing before. We walked into a suprisingly tiny shop covered carpet to ceiling in bolts of beautiful pinstripes, windowpanes, and solids. The left wall displays hundreds of options for suits and sport coats. The right, hundreds for shirts. Tiny aisles boasted dozens of options for jacket linings and dozes of floral prints for cuff and collar. Style guides throughout provide inspiration while a a few employees scurry about entertaining, waiting upon, and taking the measurements of those fortunate enough to know this place exists. It is a small, unassuming place of beauty, creation, and absolute baller-ness! And it was, for my demeanor at the time, overwhelming. I motioned to Kavitha, gave the international sign for “abandon ship,” and made for the door. An outstretched hand stopped me. The rest is calming history, followed by one of the coolest and most fun experiences in this clothes horse’s life. Brad, vision bluring: “…Vest?” It sounded more like a gasp than a word, spoken with the inhale and scraped across my vocal chords. I was dizzying. HB and I nursed our beers while Kavitha played soccer mom and scheduled our follow-up fitting appointments. It was the most fun I’ve had in a long time…a complete and unrelenting moment of fashion zen. Second and third fittings followed (these are mandatory), and I’m now the proud owner of the items shown below. They fit perfectly because they were, throughout the course of a week, built around me. At the second fitting, the blazer lacked both a collar and sleeves. But I wasn’t afraid. 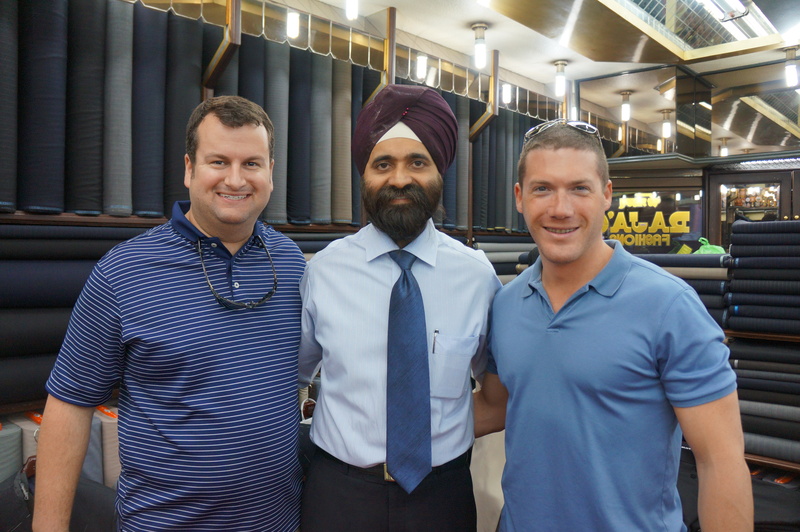 With the experience complete and products on hangars in the hotel closet, I’ll tell you this: When you go to Bangkok, go see Mr. Bobby Gulati. You’ll have a blast! And take the drink…you’ll need something to toast your investment in awesome. Check out Raja’s Fashions on Facebook for more photos and information! I believe Kavitha needs a treat, too! I love that they gave y’all some beers to chill as you looked at the fabrics and figured stuff out. Awesome suits and shirts. Next y’all strike a pose.